Elaine Hancock (Olney, United States) on 24 February 2017 in Miscellaneous. These were at the farm where the peacock was located. These bottles were really big. I was trying to figure out what would have been in them...olive oil or wine maybe. They seem a bit cracked..but beautiful..
My grandma and aunt would have created a tree with small beads and put little birds on them and inserted this into the bottle !!!!!!!!!!!!!!!!!!!!!!!!!!!!! @Devi: That sounds really lovely! Dans ma Provence ce genre de bonbonne était appelée "Dame Jeanne". Peut être que toutes les Jeannes étaient grosses ???? 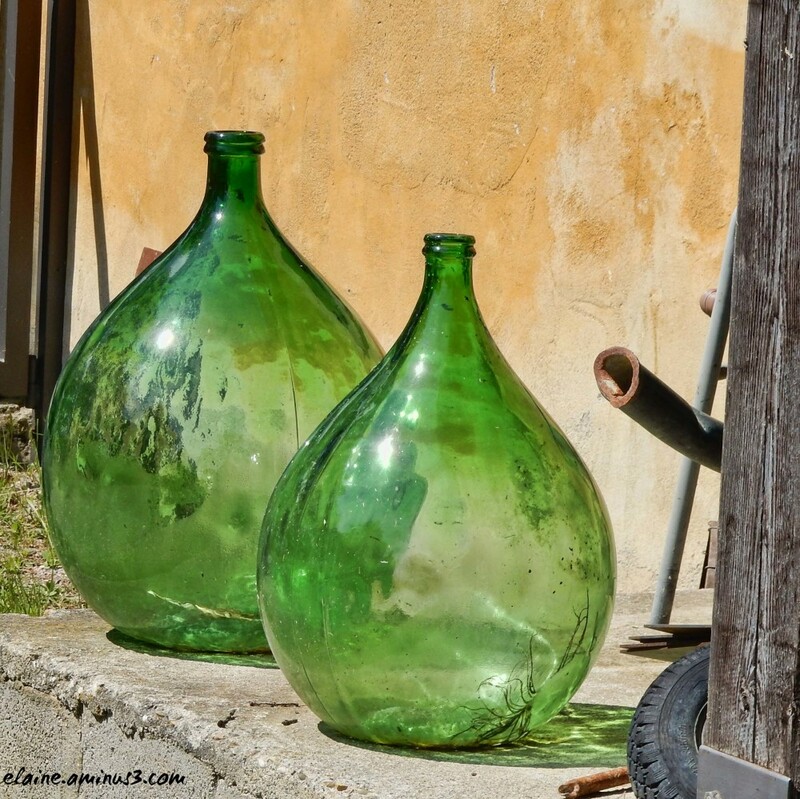 Quelles bouteilles de verre quelle double mervielleuses bouteille verte à remplir. Could be wine. I have used similar bottles for wine. The green bottles are very attractive in your picture. Wlell done. Because it is taken in Tuscany, Mediterranean climate, ancestral food culture very similar to mine (catalunya), I dare say they are bottles to let macerate Olives (to eat), or maybe, nuts and aromatic herbs to make liquor. Well seen and good image. @Graciel·la (Vic. Catalonia): That is definitely a possibility!